New Sign+Digital HomepageSign + Digital’s new website, with its range of innovative features, aims to make it easy for its target users to promote their own businesses. For nine years, Sign + Digital, based in Tallaght, Dublin, has been a leading supplier to the sign making and digital printing industry with its extensive range of sign vinyls, digital media, display products, fixtures and fittings and tools and accessories. 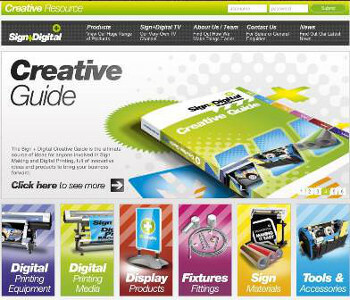 The revamped website features the Sign + Digital Creative Resource, a unique online trade platform that puts a wide range of marketing material at customers’ fingertips. Key features include the ability to download a large array of product images for clients’ websites or marketing collateral. Only trade customers have access to the Creative Resource via username and password. Site visitors can also download product flyers and host unbranded and unpriced Sign + Digital catalogues on their own websites. In addition, they can view Sign + Digital TV’s training videos and product demonstrations with helpful hints and tips on the most efficient ways to use the firm’s products. Christina Hosback, marketing executive, Sign + Digital, said: “Our philosophy has always been about making it easier for our customers to promote their own business. We understand it takes a lot of time and resources to develop marketing material which is why over the years we have used the tools at our disposal to develop a number of successful marketing programs to support our customers. The next natural step was to make this material available online in one location for our customers to access whenever they require.